This biombo, a folding screen, was used as a room divider in an elite house in New Spain. Its artist has used the long horizontal format to portray Mexico City’s urban life. Such an emphasis on the everyday is uncommon in 17th century painting, but the seemingly casual vignettes can also be read as a prescription of social roles. The Viceroy’s coach, drawn by elegant black horses, rolls past his palace façade, upper upper-class residents stroll leisurely along the tree-lined paths of the Alameda at left, while the “castes”—indigenous, African, mestizo and mulatto people—work market stalls at bottom right. The biombo offers a panorama of Mexico City’s center, and visually echoes the political order of the colony, with the Viceregal palace dominating the scene. The jail was in the palace, and prisoners stare out of its barred windows. In the foreground is a public fountains, an important source of fresh water for city residents. The muleteer who collects water may be headed off to sell his water in neighborhoods farther from water sources. Near the fountain, Indigenous women set out their wares on the plaza. They wear the huipil, a traditional garment. The left three panels seem to show a scene from the Alameda, a park about a half mile from the palace portrayed on the right. The disjunction between them suggests that some of the original panels are now missing. In this park, elegantly dressed elite women are accompanied by maids, whose clothing suggests they are mestizas or mulattas. Over the surface of the screen, gold clouds float, a feature also seen on Japanese screens. The painter of this biombo, whose name is unknown today, pays tribute to the Asian origin of the form. Large golden clouds hover over the painted surface of the scene, similar to those on Japanese screens. In all likelihood, the mixing of European narrative with Japanese-style nature painting appealed to the screen’s patrons as well as its artist. Biombos initially came to New Spain from Japan, and then, for a period, were imported through the Spanish-held Philippines. Artisans in Mexico City quickly learned to copy them, and created works that were prized objects in the homes of wealthy residents of New Spain. This work drew on the skills of a furniture maker, a painter, and a gilder who would have created the elegant gold-leaf clouds. It measures 184 x 488 cm. Biombos were luxury goods, valued both in New Spain and in Europe. This particular biombo was eventually shipped to Europe, perhaps as part of the furniture brought back by a returning viceroy or a member of his retinue, or perhaps as a gift from its elite patron to a Spanish relative or friend. It is now owned by the Museo de América in Madrid. The economies and visual culture of Spanish America depended heavily upon trade across the Pacific, as well as the Atlantic. While artists and artisans may have migrated, more often it was their creations that traveled, offering new models and inspiration for artists across the oceans. Amerlinck de Corsi, María Concepción. 1999. “Vistas del palacio del virrey en México.” In Los siglos de oro en los virreinatos de América: 1550-1700. Pp. 158-162. Madrid: Sociedad Estatal para la Conmemoracion de los Centenarios de Felipe II y Carlos V.
Pierce, Donna and Ronald Otsuka, eds. 2009. Asia and Spanish America: Trans-Pacific and Cultural Exchange, 1500-1850. Norman, Oklahoma: University of Oklahoma Press. Sanabrais, Sofía. 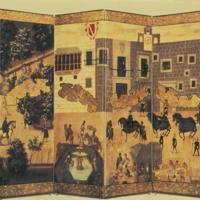 "From Byobu to Biombo: The Transformation of the Japanese Folding Screen in Colonial Mexico." Art History 38 (4): 778-791.